Born and raised in Bochum, located in the formerly West-German Industrial region around the rivers Ruhr and Rhein, Marc Räder first visited California in 1979 as a teenager during a typical familiy motor home vacation. Five years later, he participated in a high school exchange program in the northern California City of Ukiah hosted by the family of Politician and Environmentalist Dan Hamburg. 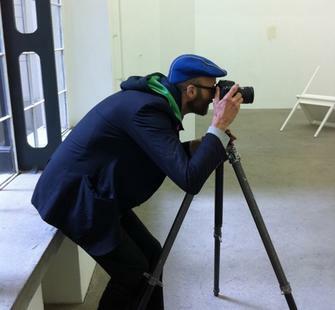 Räder later began working towards a degree in photography at Folkwang University of Arts and returned again to California on a Fulbright Fellowship to study with Larry Sultan at California College of Arts where he began experimenting with printing techniques while visiting classes on theory and history of documentary film. During this time he began a docu-fiction series about the privatization of living spaces called, Scanscape, from which he composed a book by the same title published in 2000 by Actar, Barcelona. His second monograph, Mallorca - Island in Progress, was released by Nazraeli Press, Portland in 2007. Räder continues to publish and exhibit his work around the world. With regular representation at art fairs like PhotoParis, Art Cologne, Scope NY, and Art Forum Berlin, Räder's work has been acquired by many private collectors and museums including the MoMA in New York. He has and continues to develop new projects (e.g. Californication, Hansaviertel, The Berlin Series, and Silver Coast).